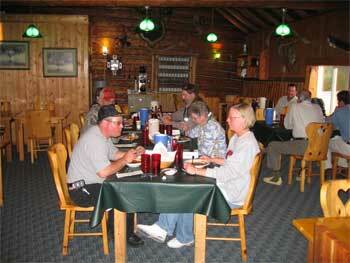 gives you the Unprecedented Service, Equipment, and Canadian Wilderness Experience you deserve! immaculate accommodations, and meals that you�? ?ll remember even after your trip, is the hospitality you�? ?ll experience that will make this your best Canadian trip ever. satisfaction is our utmost consideration! upon your arrival, you will receive a complete orientation of the lake system, including fishing techniques, presentations, locations, and a well marked map. 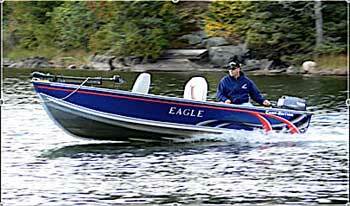 A demonstration of equipment operation will start you off comfortably on your first venture out on the lake. Our motors are 20 hp four stroke Yamaha motors. 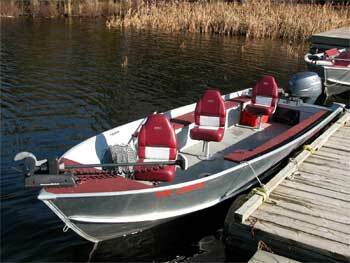 The 16 foot Lund boats have floors, swivel seats, anchors and are equipped with landing nets and fish cradles. 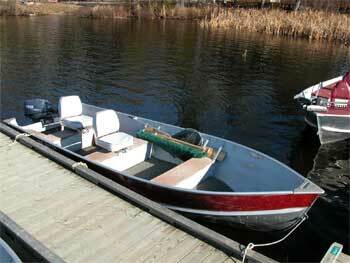 We also have some larger upgrade boats available. Your boat will be serviced with gas and maintained daily. All boats are as pictured and provided with all coast guard required safety equipment. landing nets, & anchor. Communication does not end after the first day. We are available every day to answer any questions you may have, or just to talk fishing. We can help you plan your days, whether they be fishing strategies or new adventures. 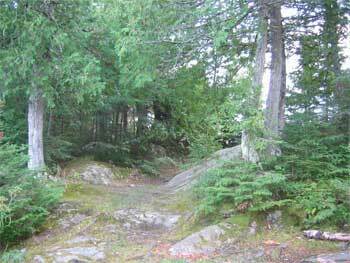 We can also direct you to points of nature in our serene wilderness. All guests receive excellent lake maps, with a detailed lake and equipment orientation, and fishing advise before leaving the dock, which helps insure a safe and productive start on new waters. 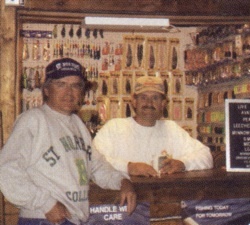 Also, fishing advise is available twice a day in our well stocked tackle shop. of immaculately kept accommodations and personal dining room service. Your accommodations will be maintained daily, including impeccable cleaning, towel service and supplying you with plenty of coffee and ice. Our well trained staff will take care of all the details to make your stay organized and comfortable. Whether it be in the dining room or on the shoreline of a quiet bay, mealtime is a memorable experience at Fireside Lodge! Breakfast is a completely open menu consisting of everything from cold and hot cereals to loaded omelets. The choice is yours every morning. Lunches are packed �? ?to go�?� as a picnic lunch or shore lunch. Picnic lunches include sandwiches, made with freshly sliced meat and bread made daily, chips, cookies, fruit & beverage. Shore lunches consist of everything you need to cook a shoreline lunch with potatoes, onions, beans, and we provide the fish fillets. 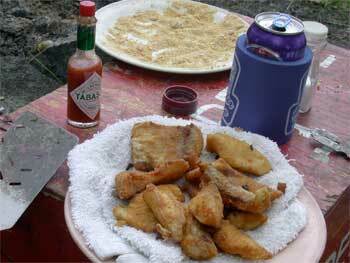 This is our contribution to the conservation program and your opportunity to enjoy a fresh fish meal cooked over a fire. As for dinner, all meals are home cooked quality with portions to delight even a hearty �? ?north woods�?� appetite, and pastries & baked goods are all made �? ?from scratch.�?� Our menu will please every taste and appetite, including health conscious choices and special dietary requirements. Your meals will be served to you at your personal table by a server paying special attention to your mealtime enjoyment. If you choose to stay out on the lake for dinner hours, we will gladly pack up a shoreline dinner for you, or, if you lost track of time and fished right through dinner time, your meal will be packed up and waiting for you in your cabin or room. 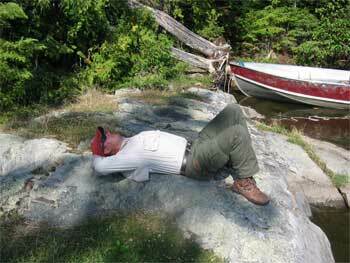 With that kind of flexibility, you need not worry about sacrificing meals or service for your fishing routine. The following is an example of the dinner menu and the meals you will enjoy! breakfast from 7:00 a.m. to 8:30 a.m. and dinner from 5:30 p.m. to 7:00 p.m.. 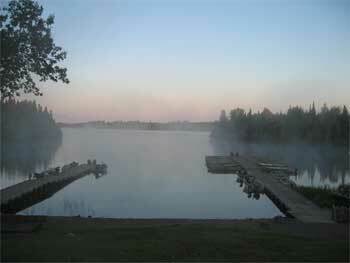 This allows plenty of time for fishing and relaxing.